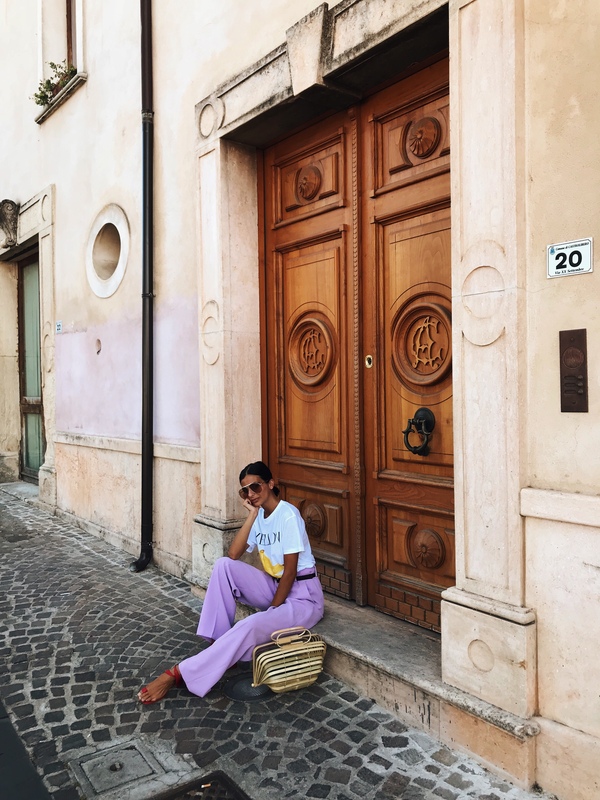 It was super refreshing for me, to finally inject pops of colour into my vacation wardrobe instead of your usual white dress or white trousers and I really wanted to push myself out of my comfort zone by adding colours. So I did it and I’m never looking back guys! 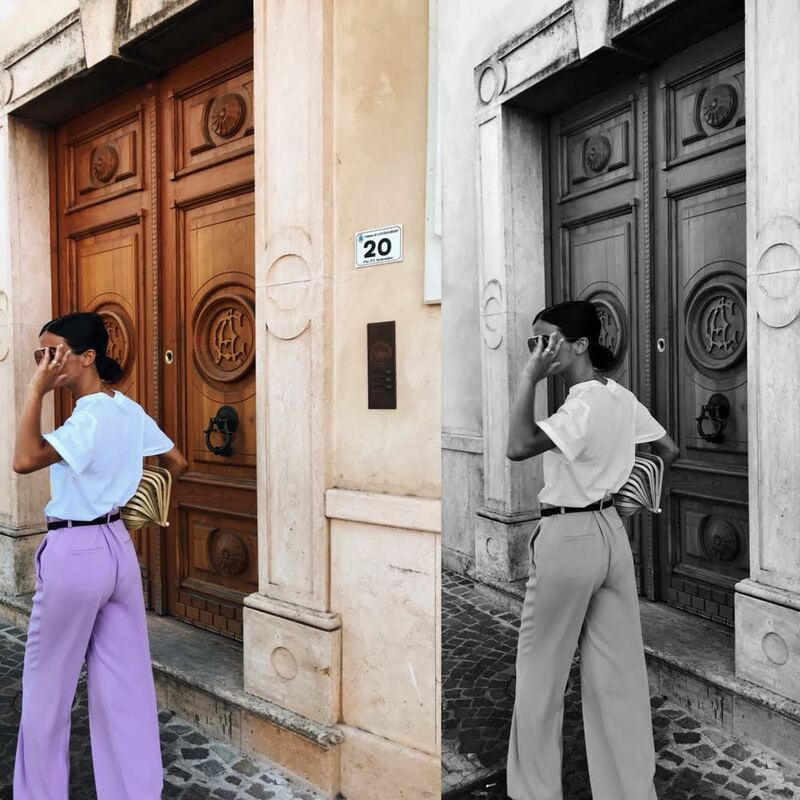 My husband tried to steer me away from this Zara purple pants (similar here and here) but to my better judgement I bought them and packed them for my southern Italy road trip! These were a little bit big on me so I added this burgundy tone LKBenett (similar here) belt to help hold them up and it worked really well as a paper bag waist style. 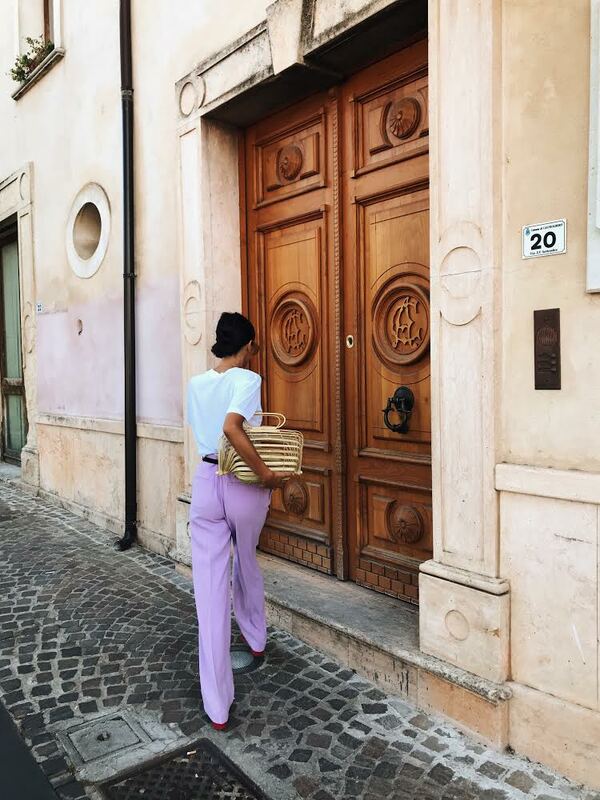 I’m really digging pastel colours at the moment and this lilac pants will see me through to fall (because fall doesn’t have to be, well dull!). I’m looking forward to styling them with an oversized camel tone jumper that hangs nicely! 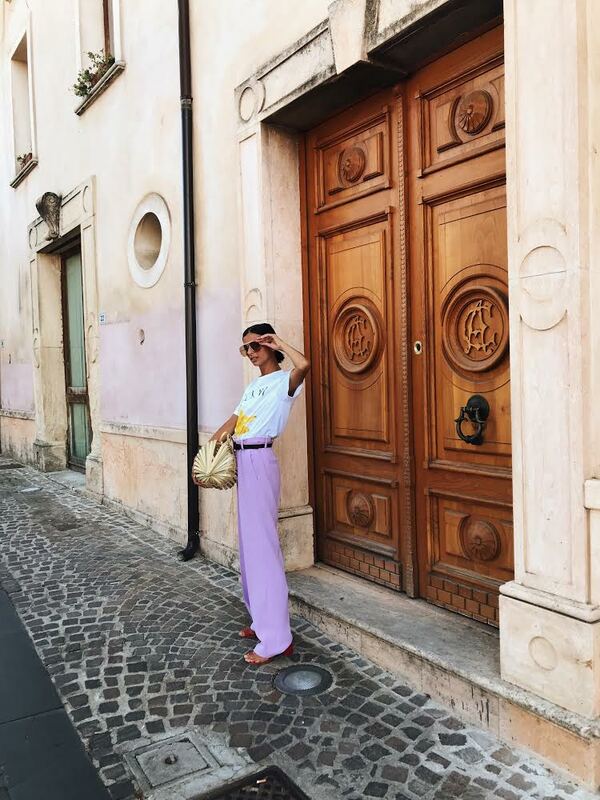 But for the warmer months I have styled it here with a Ganni tee (here) via Mytheresa.com. 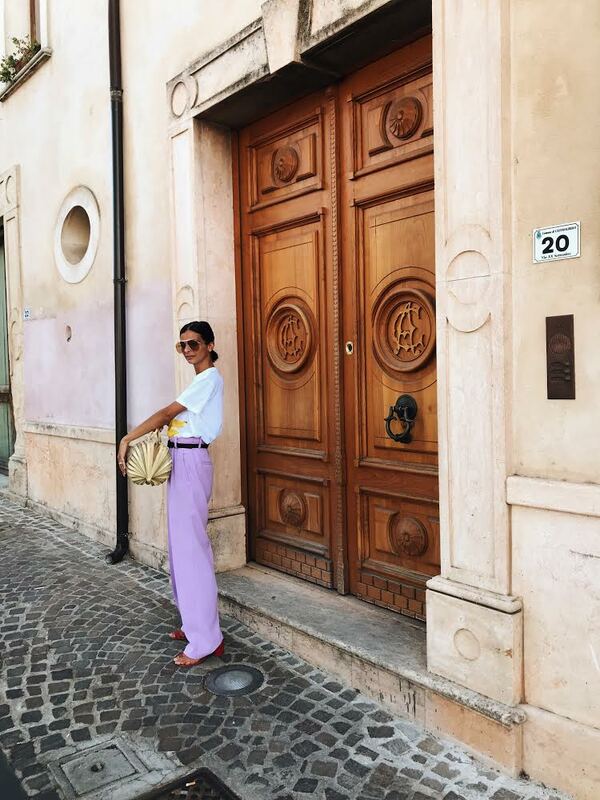 Now you guys know just how much of a fan I am of the designer Ganni, so it was no surprise that I styled these super cute lilac pants with a casual spin. 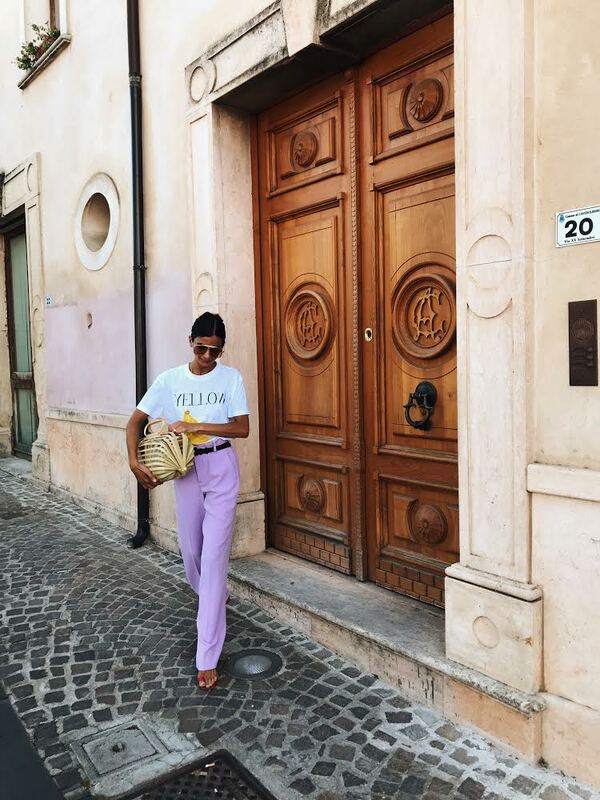 I first saw this ganni tee on my favourite influencer Lucy Williams of Fashion me now, and I love the Pop of yellow combined with the pastel tone of the pants, well it’s a winning combination! 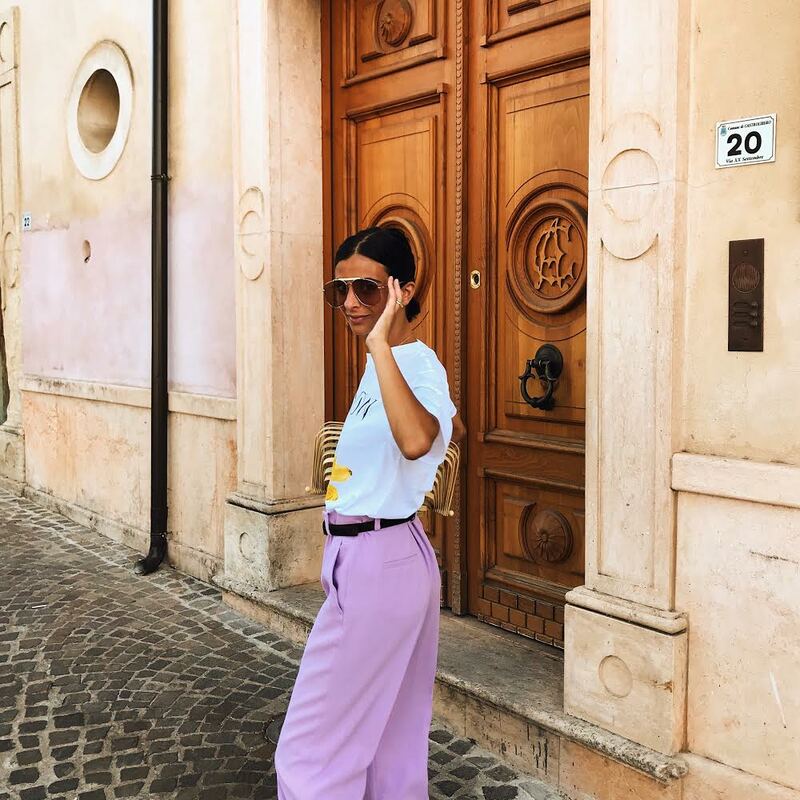 As I was looking for a laid back casual vibe teaming a pair of your suit pants with a tee will totally work and you could even add trainers for a super casual yet chic look. As the trousers were slightly longer on me I added my red toe ring sandals from FreePeople (here and in black here ) to add a little height and take some of the length off the floor! 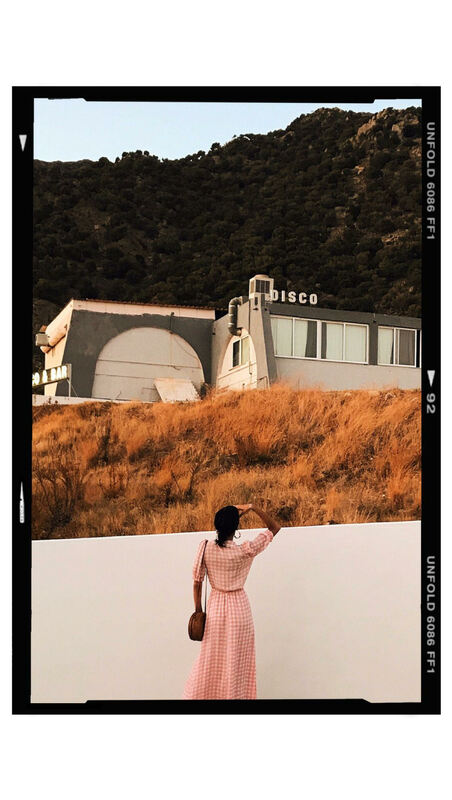 To pull the look together I wore my new Cult Gaia bag (here) via Net-a-Porter and my new Tom Ford 1970s rose tinted glasses for the ultimate laid-back but effortlessly glam feel, perfect for vacation! I love these trousers, so chic! I love styling trousers more casually as well as dressy!